Next week when the Commonwealth Parliament sits for the first time since the election, Kevin Rudd and Brendan Nelson have an opportunity to apologise, in our name, for those wrongs suffered by Aborigines and Torres Strait Islanders, in our name. We have been talking about this for over a decade. Now is the time to act. Let's consider the history of this apology. At the 1997 Reconciliation Convention in Melbourne, the Bringing Them Home Report was launched, highlighting the plight of those indigenous children removed without lawful authority and without consideration of their best interests. It's true some of the injustices suffered under the practices of past generations were 'sanctioned by law and were believed to be in the best interests of the children concerned'. Regardless of what our politicians said, those injustices could not attract compensation in the courts. There were other injustices which were not sanctioned by law and were not necessarily believed to be in the best interests of the children. Some who suffered these injustices are still alive, and they may be entitled to compensation, regardless of what our politicians might say or not say. Their compensation claims were neither helped nor hindered by John Howard's 1997 personal apology. And they would be neither helped nor hindered by a Commonwealth parliamentary apology in 2008. Most, if not all such injustices, occurred prior to 1967 when the Commonwealth did not even have the constitutional power to intervene on Aboriginal issues in the states. Yet the states have been forthcoming with their own apologies, including Jeff Kennett in Victoria who a month before Senator Herron wrote, moved the motion, seconded by the leader of the Opposition, that the Victorian Parliament 'apologises to the Aboriginal people on behalf of all Victorians for the past policies under which Aboriginal children were removed from their families and expresses deep regret at the hurt and distress this has caused and reaffirms its support for reconciliation between all Australians'. There has been no raid on the Victorian treasury coffers in the last decade. Back in May 2000, Dr Brendan Nelson hosted a dinner for Australia's key indigenous leaders at Old Parliament House to honour the memory of Senator Neville Bonner. Relations were tense between indigenous leaders and the Howard Government. Nelson spoke eloquently and impressed many of us who were there. 'In the same way that we actively embrace and own ... the idealism, self-sacrifice and values of earlier generations perhaps most notably those who defined our emerging nation at Gallipoli, can we not feel a sense of shame about other actions? There is not a parent here today who does not feel that they are doing the best they can for you. Yet you and your children will look back from the future and wonder why on earth we did some of the things we did in the name of the 'right thing'. Eight years on, the senior traditional hard men of the Liberal Party like Bill Heffernan and Shane Stone have indicated that it is time to act. The Herron-Howard rationale for inaction is no longer tenable. It is not good enough to have each new prime minister having to make a personal apology. It is time for the Commonwealth Parliament to make an official national apology. Kevin Rudd has done the right thing, committing his government to broad indigenous, community and cross-party discussion about how best to express the apology. The bottom line is that it must include an unadorned 'sorry', apologising to indigenous Australians for past injustices, and for the hurt and trauma still suffered as a consequence of those injustices. It is time for our national leaders to draw the line on our behalf so that we can move on, committed to reconciliation and narrowing those critical gaps in health, education, and life expectancy. 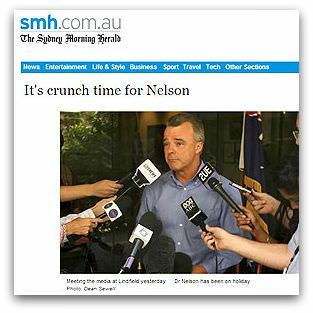 It is time for Brendan Nelson to exercise political leadership and for the Coalition parties to match personal sentiment and national commitment. It is time for Kevin Rudd to move, and for Brendan Nelson to second, the motion that we apologise and commit ourselves to put right the wrongs of the past so that we Australians can move forward shaping a reconciled future. Now is the time because we Australians have had more than enough years to understand what happened, why it happened and its impact on all of us. The Coalition parties are to be commended for their decision to support the parliamentary apology. There is still the delicate politics of finalising the wording. Minister Jenny Macklin has been meeting respectfully with a broad range of indigenous Australians who want the parliament to apologise. Prime Minister Rudd has dealt honourably with the Coalition discussing the matter directly with Brendan Nelson. History teaches that we are not quite there yet. Back in August 1988, Prime Minister Bob Hawke had invited Opposition Leader John Howard to second the first motion to be moved in the new Parliament House acknowledging the place of indigenous Australians in our history and in our national life. At the last moment, the wording of a bipartisan resolution could not be agreed upon despite John Howard’s willingness because of some refractory elements in the Coalition. Hopefully Brendan Nelson has minimised the risk of those elements derailing this important national event. When the motion of apology is moved next week, those on both sides of the chamber might recall Neville Bonner’s Jagera Sorry Chant sung in the old Parliament House at the 1998 Constitutional Convention. Sir James Killen observed, 'I never thought that the word 'gracious' could be used in relation to indictment, but this chamber, and indeed the country today, has been presented with a gracious indictment against it, and that indictment has been presented by my old friend Neville Bonner.' It is now time for a gracious, heartfelt, unanimous apology acknowledging our national indictment for past wrongs. Given the extreme sensitivity of this issue, there should be no reluctance on the part of Prime Minister Rudd in showing the full text of the proposed apology to the Opposition....church leaders...State governments and the nation at large. Once the words fly out of the mouth in Parliament they won't be able to be recaptured. Let us ALL read and accept...suggest..amend or otherwise. It's NOT a good idea to give a blank cheque to a politician, especially on such a significant issue as this. As a lawyer, Fr Brennan would appreciate the wisdom of this..regardless of where his political sympathies may lie. I strongly endorse Brian Hall's comments. If the apology is to be a genuine bipartisan gesture, then it is imperative that other political players are included in its formulation. The widespread goodwill is evident, but the process must be inclusive. As with the 1988 parliamentary resolution, I have advocated from the very outset of this process that the wording of the apology be published well in advance of its consideration by the House of Representatives. I wrote in The Age six weeks ago (28 December 2007): "The wording of the apology, its timing (including whether it comes before or after the negotiation of outstanding land rights and compensation claims) and the celebrations and commemoration surrounding the parliamentary resolution should be matters for mature negotiation between indigenous leaders and the major political parties. But the Liberal Party leadership should now be on notice: it does not have any remaining veto over the parliamentary apology. It is simply a question of whether the Opposition parties will graciously join in the preparation and passage of an apology." I would be sorry to think that Eureka Street readers could be left with the impression that I was asking any member of Parliament (whatever their party) to approve an apology unseen. This is far too important a matter for all of us. I continue to hope that all our representatives will vote for an apology in words they accept, endorse and believe. There is an air of excitement around the city today and has been since Rudd announced the date. It is past time for this apology and we have to all remember that we and our parents were complicit in the horrors committed against the stolen generations. My mother is just a bit younger than Lowitja O'Donohue and her life was one of privilege compared to Lowitja's and yet she thinks the 'abos should be lined up and shot'. I thank whoever it was, genetics maybe, or my nanna who taught me that all forms of hate and racism are an abomination. Thanks Frank and I hope you will be at Canberra's parliament for the occasion after your own years of work. Doing a Sydney radio interview last night, I noted that the compensation question is on the mind of many people. My own opinion on that is found in the opinion piece I wrote after the Trevorrow case in The Age on 3 August 2007. The link is here. As I said then, "Not all removals were morally outrageous, and not all were in the best interests of the child. Some were very suspect. It is time for the politicians to reconsider the HREOC recommendations in light of the fact that there is still a stolen generation and, through no fault of their own, only some of them could jump all legal hurdles in court." Unfortunately my presence here in the US precludes my joyful attendance in Canberra for what should be a great day for the nation. Some Australians still believe it unreasonable for anybody to expect them to take responsibility for the wrongdoing of past generations. In the Christian tradition, the prophets did not simply sheet home blame to officials responsible, but imputed it to the whole people, who would also suffer the consequences. Most indigenous Australians appreciated Labor's wide consultation. Some were angered by elements of Brendan Nelson's speech. But he did well do bring the Liberal and National Parties with him, ensuring they did not rain on the national parade as they had in 1988 and 1997.